Perennials, 20-70 cm; taprooted, caudices woody. 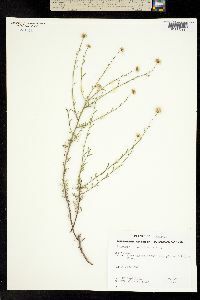 Stems erect, moderately to densely strigose (hairs appressed to ascending, 0.1-0.8(-2) mm, sometimes spreading at bases or throughout), eglandular or glands minute, non-capitate. Leaves basal (sometimes persistent) and cauline; blades oblanceolate, margins usually deeply pinnatifid (lobes in 2-5 pairs), sometimes dentate to entire, faces strigose, eglandular; basal 10-60 × 6-35 mm, cauline gradually reduced distally. Heads (1-)5-15(-30) in loosely corymbiform arrays. Involucres 3.5-5 × 7-12 mm. Phyllaries in 3-4 series, strigose to hirsute (hairs arising mostly from midregion), usually minutely glandular, rarely eglandular. Ray florets 70-150; corollas white, drying white, (2-)6-15 mm, laminae reflexing. Disc corollas 2.5-3.3 mm (throats somewhat white-indurate, not inflated). 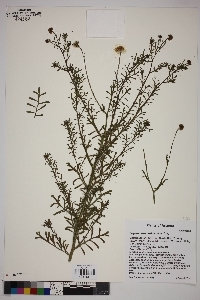 Cypselae 1-1.3 mm, 2(-4)-nerved, faces sparsely strigose; pappi: (outer 0) inner (readily falling) of (8-)10-12 bristles. 2n = 18, 36. Flowering (Jul-)Aug-Oct(-Dec). Open, rocky sites, from grasslands into oak or pine woodlands, often with madrono, juniper, or fir; (900-)1500-2700(-3000) m; Ariz., N.Mex. ; Mexico (Chihuahua, Sonora). 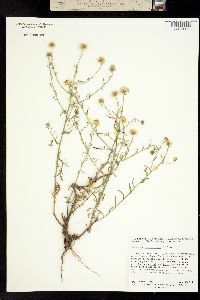 Relatively large, pinnatifid leaves are typical of Erigeron neomexicanus; plants with nearly entire leaves can be identified by the strongly perennial habit, white, reflexing rays, and 10-12 readily falling pappus bristles. 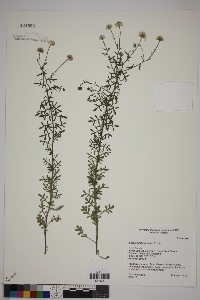 Erigeron neomexicanus and E. oreophilus were treated by A. Cronquist (1947) as varieties of one species, and their morphologic similarity and the closeness of their geographic ranges support that hypothesis. 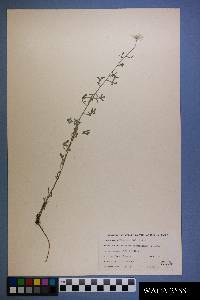 But relatively few collections are found that could be regarded as intermediates, and both forms sometimes grow in proximity, apparently without a range of intermediates. In some Arizona mountain ranges, apparently only one or the other taxon occurs. Still, the possibility exists that these are populational segregants of a single species (see further comments in G. L. Nesom 1989d).